Immerse yourself in the next level of gaming. The Stratus is a premium, Bluetooth gaming controller geared towards the gamer seeking superior performance in a portable design. With the introduction of Apple’s iOS 7, developers can now code incredible games for iOS devices with classic console control schemes we have used for decades. 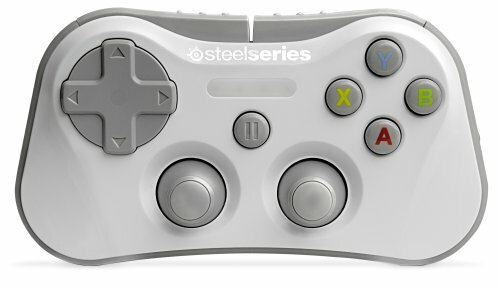 Stratus takes advantage of this breakthrough like no other controller on the market, joining Apple in bringing the revolution to light. The Stratus requires iOS 7 to work with iPad Air, iPad mini, iPad 4th Generation, iPod touch (5th Generation), and iPhone 5. Bluetooth 2.1 makes connecting to the Stratus Wireless controller a snap and also provides extended battery life. Play for 10 hours and recharge with the included USB charger. The familiar feel of the Stratus helps make the transition to mobile gaming seamless. The face buttons (4), shoulder buttons (4), analog sticks (2), and D-pad were all designed to provide that console-like vibe. To truly emulate that console feel, the SteelSeries Stratus is engineered with pressure sensitive buttons for the ultimate in analog control. The shoulder buttons, face buttons and the D-pad all feature pressure sensitivity making them as precise as possible depending how much force is applied. Great hardware will only take you so far without quality games to use it with. Thankfully, there are plenty of titles in the App Store that already support the Stratus Wireless and hundreds more on the way. From big-name blockbuster franchises like Grand Theft Auto, down to the newest indie games, the development world is all over this expanding market. The Stratus features a contemporary style to fit right in with the rest of your Apple devices. It's small enough to be portable, but large enough to easily hold and maneuver. Every Stratus gaming controller includes a cover which can be attached to the rear of the device which also functions as an added grip. White or black; the choice is yours. 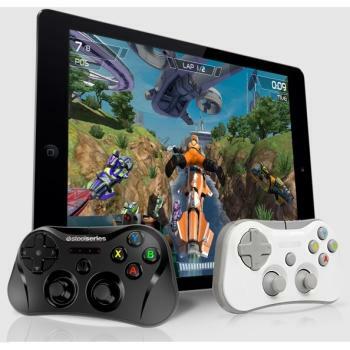 With the Stratus Wireless controller, gaming on your iPhone, iPad or iPod touch doesn't have to be a solo experience. In supported titles, up to four players can game on one screen. LED lighting on the top of the controller indicates player number to easily keep tabs on whose turn it is.